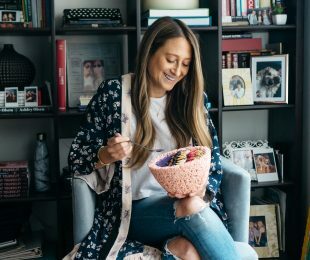 As a teen, Oz made her first strides as an author when she published The Dorm Room Diet, a how-to manual on how to eat healthy as an all-American co-ed. 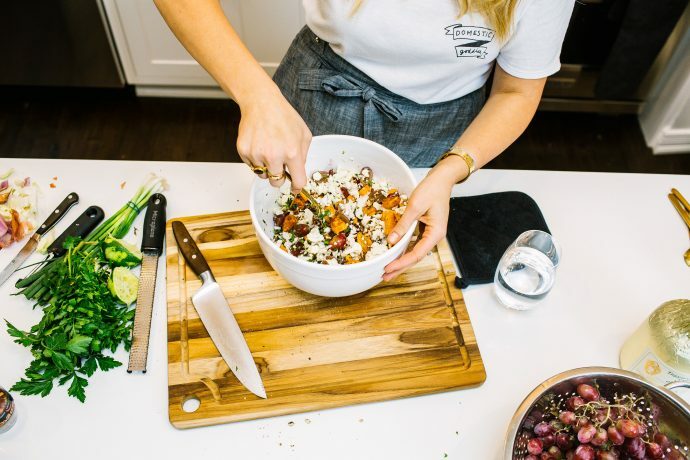 Since then, she’s gained an ardent following for her healthy, but approachable recipes and disarmingly poised demeanor whether it’s going knife to knife with Mario Batali or judging home bakers on the Food Network. But since getting married, having two kids and publishing multiple books, has the Chew co-host gained some perspective when it comes to staying balanced and healthy in her own life? 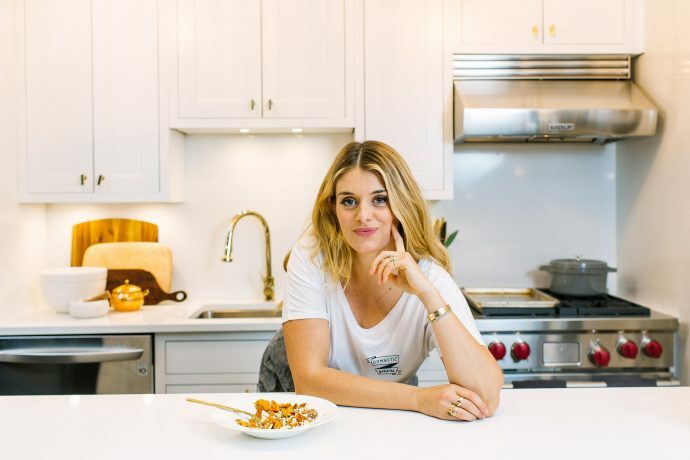 “I’ve become that much more committed to knowing what I’m putting in my and my children’s bodies, and to keeping the bulk of our meals healthy and delicious,” says Oz. 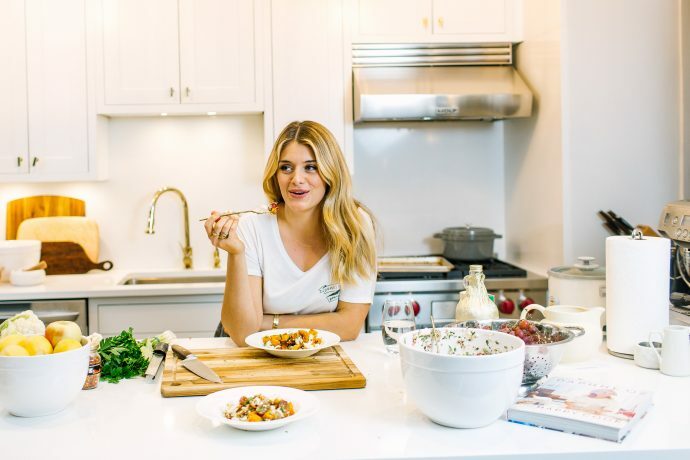 “My cooking style has become a bit faster and more streamlined.” To wit, the recipes in her latest book are just like her: casual in spirit and elevated in style and a no-brainer for moms with a lot on their hands. It’s this appealing contradiction (that and her Hitchcockian movie star looks) that has cemented Oz as America’s culinary sweetheart. Below, we caught up with Oz and talked toddler tastebuds, losing the baby weight and what food product she loves to put on her face. Since becoming a mom, has your approach to food changed? Meals have to be faster and simpler. I love making build-able meals so I can serve one dish in its plainest form for my kids and then have fun little things for my husband and I. Perfect cases in point: roast chicken or red lentil soup. I’ll make a spicy chili cumin drizzle with ghee or butter to put on top of the soup. With the chicken, I make a parsley chive, lemon zest, olive oil gremolata. It’s not a huge investment in time but it really amps things up to make it more spicy or savory. It’s something you can make quickly for yourself and add on without having to make a second meal. Are there any tricks to making a delicious meal with little time? I’ve spent a lot of time figuring out how to coax max flavor for minimum effort, which is why I love roasting so much! It brings a food’s natural sugars to the surface and caramelizes them, leaving a rich, decadent flavor in even the healthiest meals. Do your kids have a favorite recipe in your book? My daughter loves the crispy chicken and zucchini. I love fried rice but I didn’t want to be eating a sugar bomb of white rice. It tastes just like it though it’s the most insane thing. You take leftover rotisserie chicken and throw it in the pan with butter and soy sauce. Let it brown a little with onion and then you add zucchini rounds. Don’t over crowd the pan otherwise it gets soggy instead of crispy. And then it becomes this insanely deliciously combination of flavors. What I find is that a lot of what my kids resist eating something what I’m making it was because it was a textural thing. They get lazy and don’t want to chew so much, so I chop it up super small. It makes all the difference in the world. Have your routines changed since having children? The questions I get asked the most from busy parents is how do you make time to cook? And how do you keep it from feeling like a chore? My answer to that is the biggest lie that we tell ourselves is that balance is stationary. It’s not, it goes back and forth. Sometimes you’re all about working and other days you’re all about family. I don’t go to the gym as often as much as I should. My inbox is always overflowing. You’re learning to reorder and revalue the things that were so important to you from before to make them fit so that you can still hold on to them in this 2.0 version of you. Those are the things that make up a whole. You shouldn’t lose them just because you’ve added this wonderful child to your life. But at the same time, you do have to make adjustments based on the fact that you can’t take four hours to make a lovely leisurely meal. How do you deal with toddlers with finnicky tastebuds? The best advice I’ve received from this subject was from my grandmother. She said, “Don’t make your kids resist you more than they’re resisting their food. Don’t make it a battle of wills.” Recognize that there will be nights where they’ll be angels and they’ll eat everything you put in front of them and they’ll be nights when they are trying to assert themselves as independent creatures and all they’ll eat is cereal with milk. You just can’t take it personally. And you can’t be heartbroken that you spent all this time making this gorgeous meal and they won’t touch it. The more I let Philo and John sit with us and see what we’re eating, the more likely they want to try what we’re having and want to be a part of it. Even if they taste one bite. At least it’s something where I’m not making them afraid of the food or forcing the food. I’m trying not to give them complexes that we are so quick to fall into. Do you have any tricks to incorporate more veggies? I do a beet and turkey Bolognese because my kids love meat sauce. It’s not sneaking it’s just incorporating new flavors into things they know and love, which makes it that much more accessible. What’s your policy when it comes to playdates and birthday parties? I’m the most easygoing when it comes to that. 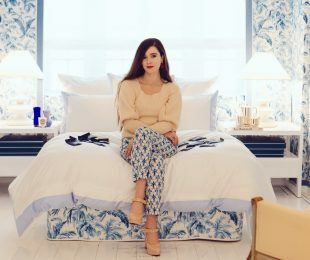 The best strategy is to make your home a place where you control it. You keep healthy options at all times. The best thing I’ve done is crowd out the bad options so that those become the obvious choices. Not just for her but for me. My pantry has all these legumes and beans, things that make it really easy to have a healthy meal come together quickly. So much of the problem we have with finding ways to eat healthfully in this country is that you have to think too much about it. If you don’t have to go to the store and still make a good meal, it makes it that much easier. What are your favorite pantry meals? I do black bean sautés all the time. For breakfast we do black bean, cumin and oregano over scrambled eggs or even on their own with a little avocado. You can do a vegan taco with that. With lunch I’ll put them over salad or use them as a side dish. Or I’ll do half pasta and half white beans so I’ll have the sensation of having my bowl of pasta but not the insanity of it. My mom has gotten me ordering my angel hair pasta from Amazon; a microplane; good olive oil; Banza pasta. What’s your current ingredient obsession? 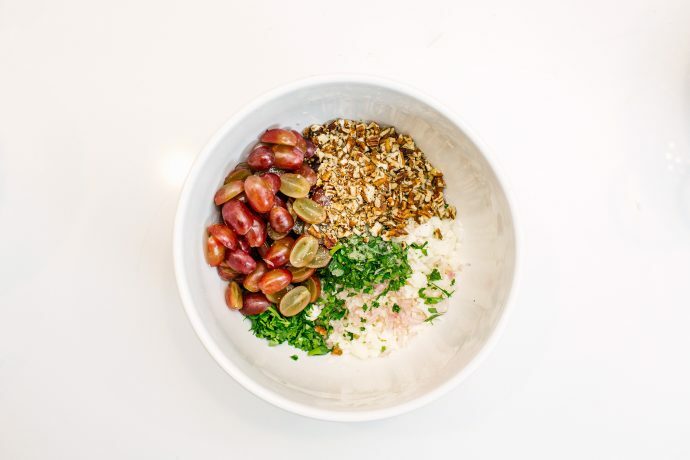 I’ve been using tahini in everything. I mix it with honey and lemon and salt and ice water and a little bit of grapeseed oil and I drizzle it over roasted sweet potatoes with pomegranate seeds with fresh herbs and fried almonds. It’s so beautiful and easy. I do it for dinner parties all the time. I also love the halva from seed and mil, it’s like Butterfinger but melts better. What is an essential kitchen appliance for a mom? A rice cooker, it’s so easy. It’s passive cooking. You can set it when you walk in the door and not have to think about it. You can’t walk away from a pan, where if you’re doing a slow cooker or dutch oven, you can just leave it in there and let it perfume the house while you’re getting other stuff done. That and a Kitchenaid stand mixer, cast enamel dutch oven and wooden spoons for mixing – I can’t tell you why, but they make everything taste better. Take us through an average day of your meals? I like to make smoothies and my kids love them too. I look at them like an insurance. You don’t know what your day is going to be like or theirs so it’s nice to have this huge boost of nutrition first thing in the morning. I do a Green Monster smoothie, which is avocado, spinach, yogurt and apple juice or water and banana. If I’m having breakfast at work, I’ll have a frittata or oatmeal. On weekends, I splurge and do a fun eggs dish, a frittata or pancakes. For lunch, I do a big chopped salad, I try to do vegetable proteins with chickpeas or lentils over greens. I make my own vinaigrette. Red wine vinegar, olive oil, Dijon mustard, salt and pepper and shallots. It changes everything. Are there any supplements you rely on? Probiotics. People have no idea what a difference probiotics make to your health overall. It doesn’t matter if you’re eating the best food on earth, if you’re not absorbing it, because you have no gut nutrition, it doesn’t help you. The most effective is to have it in foods. So sauerkraut, naturally pickled things. Kefir in yoghurt. It’s a vanity thing. I think my skin looks better when I have it. My eyes are whiter, the whole deal. Turkey jerky and Halo Top ice cream – the peanut butter is my favorite! I take all my makeup off with coconut oil at the end of the night. I prefer the Kelapo one in the dark jar because otherwise it goes rancid fast. I buy a small one because it goes bad so fast. I usually do it after the shower. I’ll wash with Tata Harper Regenerating Cleanser and I’ll use her brightening serum or Dr. Hauschka under eye cream and then I buy an organic argan oil and I’ll do a hair mask. It’s so greasy and disgusting but once a week. Especially when you’re going in hot and cold all the time, your body needs that extra protection. Did you follow any nutrition plan after having John? I was eating anything and everything to boost milk production. Oatmeal really helped, barley based soups, a lot of bone broths. It boosted the nutritional value of the milk. It made me feel good and that is huge. The more you rest. How do you deal with balancing your own well-being and being a mom? At a certain point, I’ve realized it has not been my number one priority to have my health go first. Moms juggle everything. Work, kids, commitments. I have tried to tell myself to be easy and be gentle because it will happen. I grew up in a family that loves to cook and loves food and loves planning meals so food is love to me in a lot of ways. We do lean on that creative practice and that enjoying sharing of food as a way to show love and that for me was a huge problem as a kid, I was overweight because I didn’t know how to separate food from love. And now I try to have that love of food and that exploration and fun without it taking over my life either. 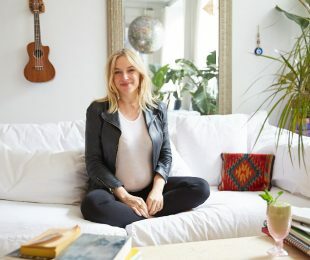 What’s your philosophy when it comes to “losing the baby weight”? It’s a totally different kind of weight loss. I lost weight as a kid that had no relationship to losing weight as a postnatal mom. I look around and I think it’s so inspiring to see these moms that are such examples of fitness and examples that your body can look even better after you have kids. There is a time after you birth a human where you feel disconnected to your own skin. I didn’t feel strong in my skin. I hate that feeling when your belly is still saggy and you’re exhausted and totally disoriented and awake at all hours of the night and you’re so disconnected from what you remember yourself being like and it takes that time to get reacquainted and relearn yourself with the things that make you feel more powerful. Fitness is part of that. Because it is involved in giving you back that confidence, that strength in your own skin. I love workouts that help me forget that I’m working out. I love Dance Body and Soul Cycle, you get in that room and zone out. Ballet Beautiful is great for lengthening and strengthening. Are you the resident health expert on the show? Most of them would acknowledge that I made them like kale and quinoa more than they used to. But I love Doritos and cake and everything else that we have around all the time. How do you stay on track when you’re constantly cooking and trying super indulgent things? I call it my two bite rule. I developed it during season 2 after we all gained our first “Chew” baby. I never want to feel deprived and the first bite I have is to see what’s going on and try everything. The second bite is where I get to indulge and to have that moment where all the flavors come together. Beyond that every bite tastes the same. I make a really conscious choice. Is this really something I want to continue to eat or am I eating it just because it’s there. Most of the time I try to fill up on really healthy foods. Healthy but super flavorful foods. If it’s not flavorful I don’t care if it’s healthy. So I can have side portions of the fried chicken or mac and cheese or whatever it is so I’m not using those foods to fill up on. That’s the biggest thing. You can have what you want every time you want it as long as you don’t go crazy. When I was writing about losing weight in Dorm Room Diet, I was learning that having one cookie didn’t mean your whole day was ruined you had to eat the whole box. It’s so self sabotaging and it robs you of so much joy. What I’ve learned the last 6 years on the show, I’m constantly surrounded by food, I could be 800 pounds overnight, but what I try to do is I always try to have what I love but never lean on it for something more than that momentary pleasure. Did you change your diet at all while pregnant/nursing? I am totally bipolar when I’m pregnant: I’m am equal parts spinach smoothies and burrito bowls. I am fanatical about great supplements when I’m pregnant too – I take the Metagenics pregnancy pack plus extra essential fatty acids and vitamin D for baby’s brain development. When I am nursing, I just eat more than you would ever think humanly necessary to try to keep my milk production up. I had to avoid onions and garlic with John as well since he wouldn’t touch my milk if I’d eaten them. What relationship do you want your daughter/son have towards food? I want them to love food the way I do! It should absolutely be full of joy, pleasure, adventure, sensation. But I also want them to always be able to keep food in a healthy perspective so it doesn’t have control over them in a negative way. 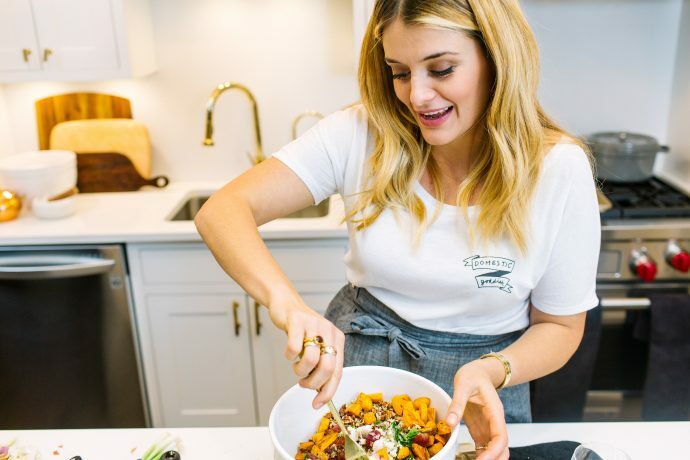 I crowd their plates with healthy options, sneak healthier blends into foods I already know they love (like tons of veggies in their bolognese sauce – recipe in The Happy Cook! ), and lead by example in the way John and I eat. But I also try not to let it totally crush me if some nights they just want cereal and milk for dinner. Kids will be kids, and I don’t want to make food a fight. What meal makes you the happiest? Anything with all my family! My favorite meal at the moment would be a frisee salad with shallot vinaigrette, roast chicken with shoe string fries and a dense, warm, fudgy brownie a la mode with plenty of wine. But I could just as easily go for fresh fish tacos and stinging cold beers on the beach. In your book you say cooking can be therapy—what dish is the most therapeutic for you to make? Anything baking. Sweet baking in particular. Anything with butter and sugar is automatic relaxation. Cookbooks that you live by? I love Middle Eastern books, so I have the complete Ottolenghi collection. I love the Gjelina cookbook, especially all their great condiments. 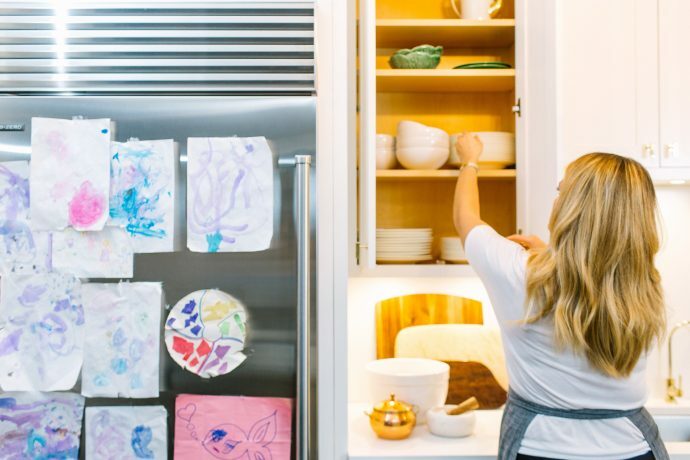 The Happy Cook and The Oz Family Kitchen are our family go-to’s, duh. I bake most from The Silver Palate Cookbook. And I love Gwyneth’s books – the recipes always come out perfectly. After an indulgent week, what’s your trick to feeling “clean”? I love a visit to the King Spa Sauna, a Korean Day Spa near my parents’ home in NJ for a total body cleansing. I also love a day of just green juice – I never do more than a day, but it’s a nice break for your digestion, and a great flow of nutrients as long as you keep fruit juices to a bare minimum. A great workout always does the trick too. John is up around 5, gets his bottle, and usually goes back to bed until 7 when we have breakfast together: a yogurt and fruit of some kind, or eggs. Then Philo gets up around 8 and it’s her turn for breakfast – she loves oatmeal, waffles, or toast with cream cheese, and her brother often steals a few mouthfuls of hers. They both get smoothies, too – a mix of avocado, spinach, banana and yogurt: it’s my insurance policy for a big boost of nutrition first thing in the morning. Then the kids go to school or classes some mornings, and some mornings we go to the playground if its nice or go see a show or some other planned activity with their friends, and some days we just hang around the apartment and do art projects or have dance parties. I cherish every last minute of nap time in the afternoon to get work done! I should probably work out at this time, but it always seems to take last place. 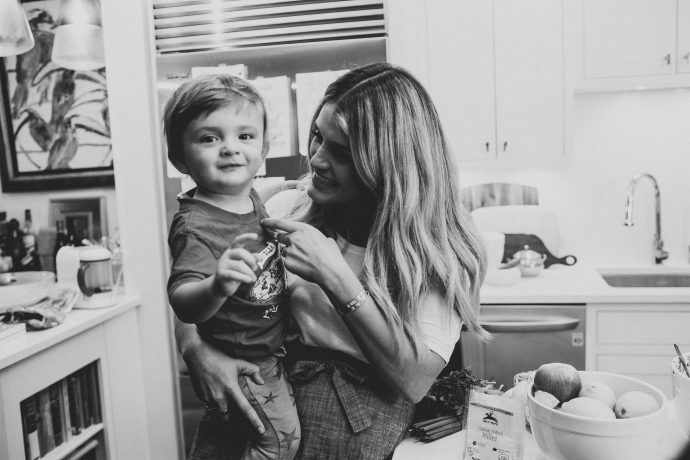 At night, they like to hang around and “help” me in the kitchen, and we’ll typically sit down and eat, then do bath time, then a little TV for Philo while I put John to bed and get dinner ready for my husband. Then we wind down and read books and put Philo to sleep. And then I get a little time to myself with my husband, depending on how long I stay awake. Trick to staying healthy on the road? Plan ahead! I always have jerky and seed bars in my bag on the road so I don’t fall prey to the call of potato chips. What’s your favorite recipe in the book? Everything Bagel Biscuits (with layers of cream cheese and chives baked right in)! What makes a Happy Cook? A happy cook is a confident cook! I wrote this book in hopes that I could share the recipes that help make my time in the kitchen day in and day out fun and relaxing, so my readers would look at their time in the kitchen as freedom rather than a chore. The book is full of simple tricks and techniques I use to maximize my time and keep my family’s tastebuds happy, but I also get personal about why cooking relaxes me, and how I keep it easy on myself – which is why I want to keep coming back for more! 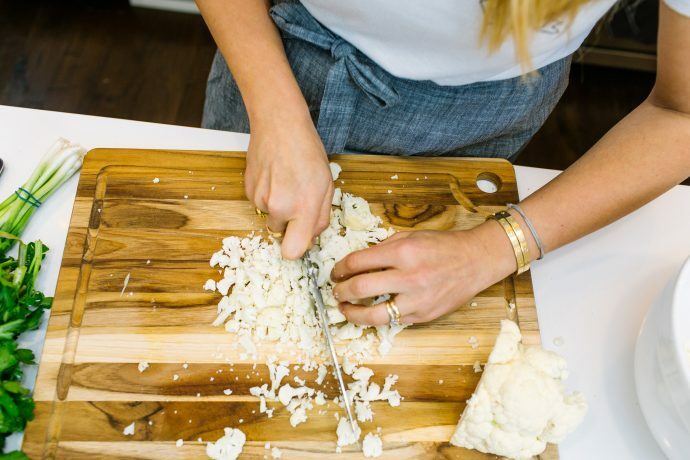 I wanted to share the little things I do to prepare in advance, or set my self up for quick meal success, because we all take it too hard on ourselves, and being in the kitchen should be one place we get to come to day after day where we’re guaranteed a little R&R. Place the pecans on a rimmed baking sheet and toast until fragrant and golden brown, 7 to 8 minutes. Transfer to a plate and set aside. 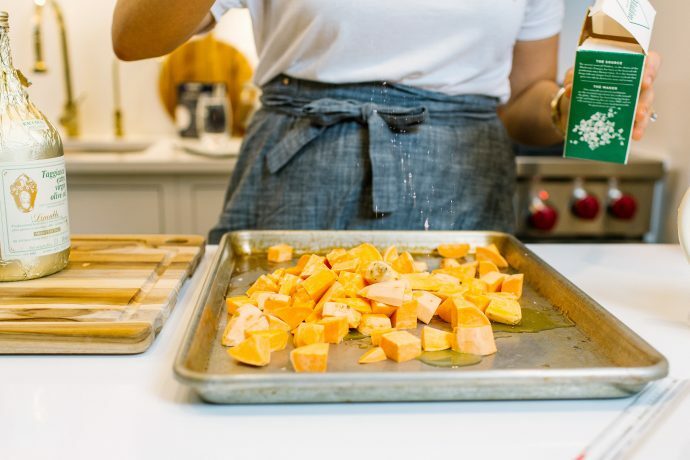 Place the sweet potatoes or squash on the baking sheet and drizzle with 1 tablespoon of the oil. 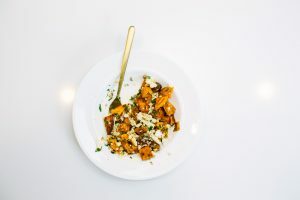 Sprinkle with 1 teaspoon of the kosher salt and the chile flakes and roast for 30 to 35 minutes, until browned and tender, turning the potatoes or squash midway through cooking. Transfer them to a platter. Place the pecans in a medium bowl. 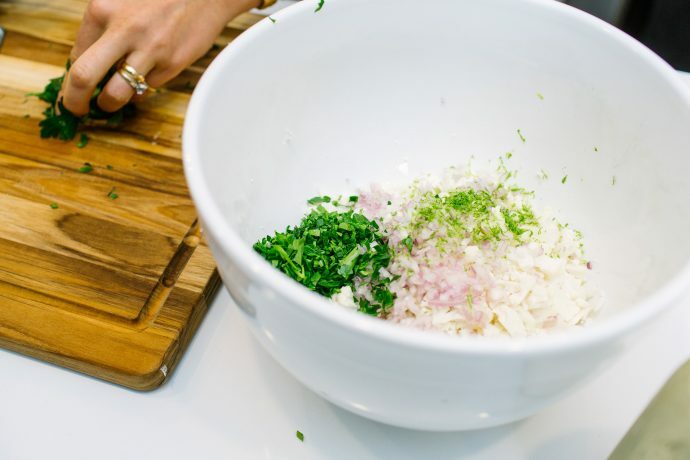 Stir in the cauliflower, parsley, shallot, lime zest, lime juice, and the remaining 2 tablespoons oil and 1/2 teaspoon kosher salt. 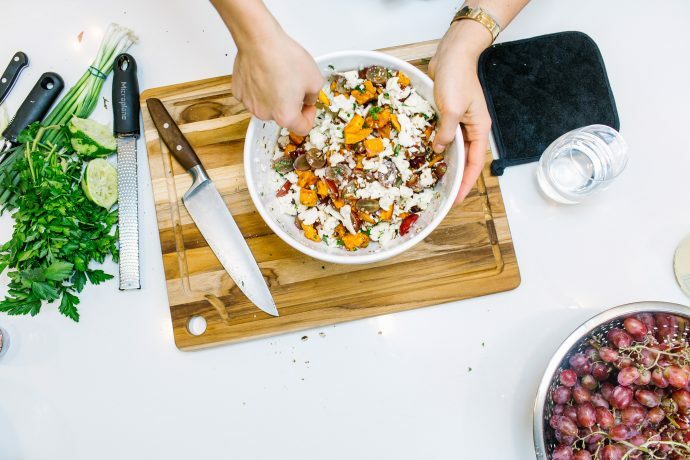 Serve the pecan mix over the sweet potatoes and sprinkle with the grapes (or cherries) and flaky sea salt.